arrow next to the filling pump indicates the side of the vehicle. ■ Switch the engine off. 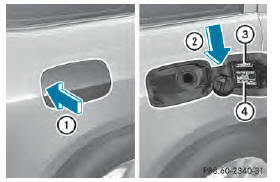 ■ Remove the SmartKey from the ignition lock. ■ KEYLESS-GO: open the driver’s door. This corresponds to key position 0: "key removed". The driver’s door can be closed again. ■ Turn the fuel filler flap counter-clockwise and remove it. ■ Insert the fuel filler cap into the holder bracket on the inside of filler flap 2. ■ Completely insert the filler neck of the fuel pump nozzle into the tank, attach and refuel. ■ Only fill the tank until the pump nozzle switches off. Do not add any more fuel after the pump stops filling for the first time. Otherwise, fuel may leak out. ■ Replace the cap on the filler neck and turn clockwise until it engages audibly. ■ Close the fuel filler flap. Close the fuel filler flap before locking the vehicle. warning lamp may light up . A message appears in the multifunction display . For further information on warning and indicator lamps in the instrument cluster, see .